One of the most important tools a fire alarm technician posses is the digital voltmeter or digital multi meter. This article will explain the different settings and how they can help you track down important circuit information such as end of line resistance values, current draw, reverse polarity, dead shorts, ground faults, AC inductance and capacitance. I cannot stress enough the importance of purchasing a quality voltmeter or multi meter. 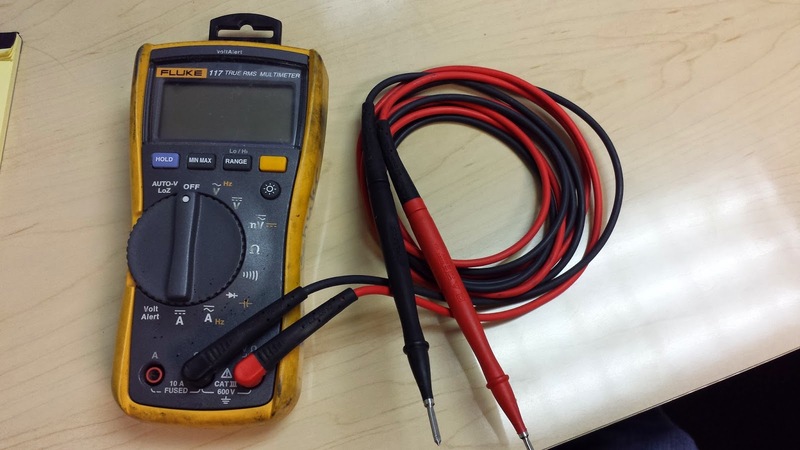 For the purpose of the this article I will be utilizing a Fluke 117. This is a high end meter that won't break the bank. It has all of the key settings including a back-light for dark spaces as well as non-contact voltage detection. In case you did not catch that last one, it will detect high and low AC voltage just by simply holding the meter close to the source. You can read more about this powerful true-rms multi meter here. In this article we will show you how to properly tune the voltmeter or multi meter to the correct settings as well as when to move the test leads depending on what circuit information you are trying to obtain. Now it is important to explain the different symbols and buttons so that you better understand how to navigate through this information. Please note that although I am referencing the Fluke 117, these symbols should be close to the same on any multi meter you are using in the field. "HOLD" This button will hold the display at the current view for documentation at a later time. As you may know, the multi meter display may fluctuate from time to time so this button can prove to be useful if you want to lock it in at a particular time. "MIN/MAX" As stated above the multi meter display will fluctuate between higher to lower readings. This button can be pressed to either lock in the lowest/minimum or the highest/Maximum reading. Also note that on this meter, there is another selection with this button that will display the average between the minimum and maximum. "RANGE" This multi meter has both manual and auto-ranging modes. In auto-range mode the meter will automatically select the range with the best resolution. In manual mode you must use this button to cycle through the different ranges whether it be for resistance, voltage, current capacitance, etc. "YELLOW BUTTON" the yellow button on this meter is like a shift key. It will allow you to select the yellow options located on the rotary wheel. Below is a list of the most important multi meter modes and what they can be used to test for. 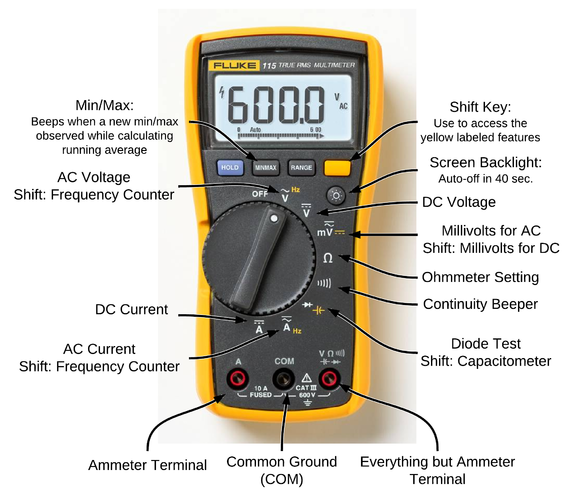 Feel free to click on the separate links to read further on these topics: Please note the picture below is of a FLUKE 115 which is basically the same as the 117 minus the AUTO-V LoZ and Volt Alert settings. "AUTO-V LoZ" Automatically selects ac or dc volts based on the sensed input with a low impedance input. AC voltage from 0.06 to 600 V.
DC voltage from .001 to 600 V.
Learn More About Reading for Voltage on Fire Alarm Circuits Here. Continuity beeper turns on at less than 20 ohms and turns off at greater than 250 ohms. Learn More About Reading for End of Line Resistance, Ground Faults, Shorts and Continuity on Fire Alarm Circuits Here. Diode test. Displays OL (Open Line) above 2.0 V.
Learn More About Reading for Reverse Polarity on Fire Alarm Circuits Here. Learn More About Reading for Capacitance on Fire Alarm Circuits Here. AC current from 0.1 A to 10 A.
DC current 0.1 A to 10 A. Learn More About Reading Current on Fire Alarm and Control Circuits Here. "Volt Alert" Non-contact sensing of ac voltage.